Women in their post-menopausal years can never be too busy to be informed about the risks of cardiovascular disease, especially when their daily routine serves as an indicator of health. Women’s Health Matters spoke to Dr. Paula Harvey, director of the cardiovascular research program at Women's College Hospital, about the link between menopause and cardiac health, how a healthy lifestyle can reduce post-menopausal women’s risk of cardiovascular disease, and how it is never too late to take control of your health and well-being. The risk of hypertension and cardiovascular disease increases in the menopausal years. Dr. Harvey notes that menopausal women are at a predisposition for cardiac problems due to physiological imbalances that occur during menopause, such as estrogen deficiency. “When a woman loses ovarian estrogen it adversely affects her cardiovascular risk factor profile,” says Dr. Harvey. Dr. Harvey notes that pre menopausal, perimenopausal and post-menopausal women should be all be aware of factors beyond physiological changes of menopause that increases cardio vascular risk, such as lifestyle factors. The sedentary habits of today’s society are contributing to the increased rates of obesity, which directly affect the rising rates of cardiovascular disease. 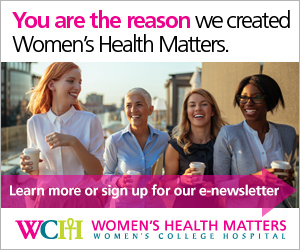 Women have the opportunity to make important changes to their lifestyle to see immediate benefits in their overall health, especially cardiac health. A portion of Dr. Harvey’s research focuses on the potential reduction of cardiac fatalities with the help of exercise. Dr. Harvey states that several research scenarios have proven that integrating physical activity and proper nutrition will greatly reduce cardiovascular health risks. “Post-menopausal women who walked for 45 minutes on the treadmill saw a significant decrease in blood pressure immediately after exercising,” says Dr. Harvey. Though post-menopausal women are considered most at risk for cardiovascular disease, women in their premenopausal years are still a concern for cardiovascular physicians. “The age group that has not seen improvement in cardiovascular disease outcomes, despite all the recent advances in treatment, is women from 35 to 55 years of age,” says Dr. Harvey. Consulting your doctor during this period of your life is essential in order to be aware of your base line cardiovascular risk. Anyone can make small changes for greater health outcomes; even those with mobility issues. Women who have been diagnosed with a chronic disease in their post menopausal years may also live with other conditions such as osteoarthritis, which may limit their physical activity and functional health. Dr. Harvey assures that these women have multiple options to improve their functional health by attending supervised cardiac primary prevention and rehabilitation programs. These programs offer a personalized approach to care with one-on-one consultations to establish the most effective strategy. Personalized cardiac health solutions are ideal for post-menopausal women and even premenopausal women who have yet to make their health their main priority. Often these women are so concerned about their family that their own health is compromised. “There is a lot of resistance and lack of motivation among patients to attend cardiac prevention and rehabilitation programs,” says Dr. Harvey. Women need to be empowered to seek care and make changes for a lifetime of good health, and it is never too late to start. Post-menopausal women may feel that increasing their daily exercise, changing their diet and modifying their overall lifestyle is a waste of time because at their age they won’t see any difference. Dr. Harvey notes that by thinking it is too late to worry about one’s health, as a patient you are helping create health care barriers. Breakthrough health barriers by reassessing your own risks while finding avenues that are enjoyable beyond the gym. “It is never too late to start exercising, to stop smoking, to make positive lifestyle modifications, and it is never too late to take control of your own health because you will see the changes right away,” says Dr. Harvey.